1 Combine onion, soy sauce, lime juice, mirin and ginger in a 7-by-11-inch (or similar-size) baking dish. Set aside to marinate. 2 Bring water to a boil in a medium saucepan. Stir in quinoa. Reduce heat to a simmer, cover and cook until the grains are tender and reveal their spiraled germ, about 15 minutes. Remove from heat, uncover and fluff. 3 Meanwhile, season tuna on both sides with salt and pepper. Heat 1 tablespoon oil in a large skillet over high heat. Add tuna and sear for 1 minute on each side for medium-rare. Transfer to a cutting board and cut into ½-inch slices. Remove the onions from the marinade with a slotted spoon and reserve; transfer the sliced tuna to the marinade. Gently toss to coat and let sit 5 minutes. Use tongs to transfer the tuna back to the cutting board and cut into cubes. 4 Add the remaining 2 tablespoons oil to the marinade; stir 3 tablespoons of the mixture into the quinoa. 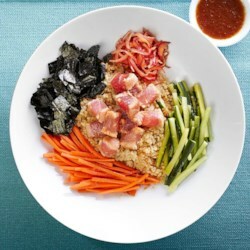 Divide the quinoa among 4 shallow bowls and top with equal portions of the tuna, reserved onions, carrot, cucumber and nori. Drizzle with the remaining marinade and serve immediately. When choosing ahi (yellow­fin) tuna look for U.S.-caught fish (from the Atlantic or the Pacific)—it's most likely to be sustainably fished. For more information about choosing sustainable seafood, visit seafoodwatch.org.